Home / Sponsored Post / Bullseye Powder Coating To Offer Innovative Powder Coating Service at Affordable Rates! Bullseye Powder Coating To Offer Innovative Powder Coating Service at Affordable Rates! 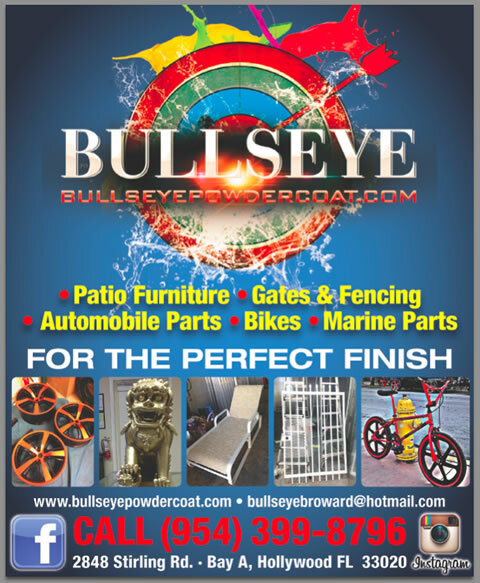 Bullseye, a Broward based company is offering its powder coating services for a wide range of consumer, industrial & commercial applications in the Broward and Dade Counties! Located at Stirling Road Hollywood, FL, Bullseye is a company which specializes in providing powder coating services and solutions to commercial as well as residential property owners. They have a team of highly skilled veterans who can ensure finer quality and long lasting finish to metal structures, plumbing system, gates, electric panels, etc. They use a highly advanced method of powder coating which is not only stronger, but more resistant than a normal paint. Besides, powder coating is quite cheap and does not render any harm to the environment. Whether it’s a rust, fading, corrosion, cracking or streaks on metal structure, Bullseye have a solution for it and can meet the strictest demands & codes for just any project. • More resistant & stronger than the paint. • It is environmentally friendly and is cost effective. Originally founded in the year 1994, Bullseye Powder Coating Company has established itself as one of the leading powder coating companies in Broward & Dade Beach Counties. They have a team of highly specialized professionals who make sure to maintain the highest level of excellence in all jobs they do.